Some say you can't buy happiness. We say have you ever been to Voodoo Ray's, slapped a few notes on the counter and asked for their best slice? Clearly not. 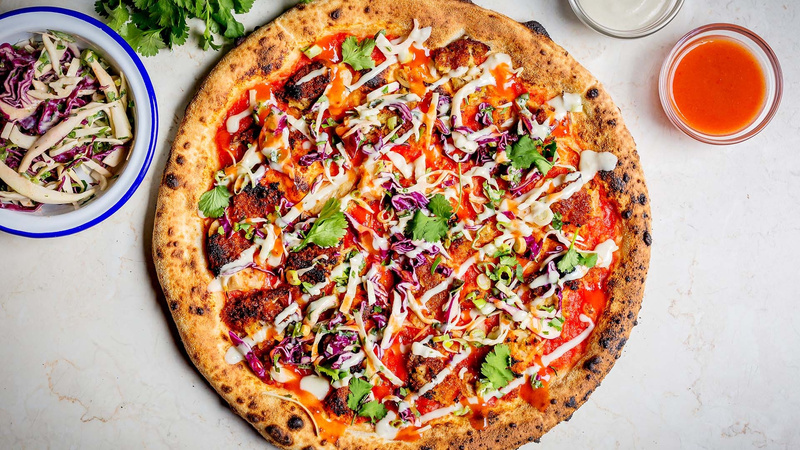 But now is your chance to do just that, because the New York-slice specialists are throwing down the dough to create an unbeatable National Pizza Day special. Going by the name 'Got Beef', the prized pizza will host an array of delicious toppings, including ground beef, griddled aubergine, spring onion, béchamel sauce, fior di latte, pecorino and napoli sauce with a scattering of fragrant parsley. Turns out happiness tastes like a meaty pizza slice topped with a smoky slither of grilled aub'. Who'd have thunk it? Intrigued? Well, good news because Voodoo Rays are also offering a fabulous 30% off all pizzas on National Pizza Day, too. We all know you like to chase your slice with half a tub of frosty goodness. But put the spoon down and hear us out: the pizza brownie has arrived and it's time you got involved. Created by gourmet brownie specialists Bad Brownie, the pizza brownie is so wrong, it might just be right. Made from a luscious blondie base with strawberry jam, grated white chocolate and melted marshmallows, the brownie looks like a proper piece of 'za. The ice cream can wait for another day, it's time to dive into this sweeter-than-sweet National Pizza Day special. Get 30% off your brownies on Saturday 9 February by following the link below. Every pizza is a special pizza when you dine at Waterloo's Crust Bros. Why? Because like all good things in life, Crust Bros' pizzas are customisable. Craving a whole globe of buratta a-top your leopard print pizza pie? Go ahead. Seeking out some spicy Italian sausage? 'nduja what you want. Gluten-free? No problemo. Crust Bros' has your back. Claim 30% off any take away pizza on Saturday 9 February. The rules of a good house guest say you should always arrive with a gift and be willing to lend a hand. When it comes to her guest pizza special, we'd say Alexandra Dudley has passed with flying colours on both fronts. Not only has Dudley brought the gift of incredible vegan eating to one of our favourite London pizza joints, she's also lent a hand when it comes to making the once-difficult decision of what to order, incredibly easy. Someone hand us a napkin: we're gearing up to feast on this onion squash, smoked broccoli, pickled onion and cashew pesto sourdough beauty and things are about to get messy. Green ain't always clean – or so they say. Now we're not sure Dean Martin was talking about Battersea's Pi Pizza when he sang the lyrics, "When the moon hits your eye like a big pizza pie. That's amore." But if he was still around, we'd like to think he might give it a little shout out between verses. This flower-filled pizzeria is, of course, beautiful and what's not to love about its National Pizza Day bottomless brunch where you can tuck into an endless array of its crisp pizzas, washed down with a cocktail, until you're spent (or until your two hours are up)? Prices start at £15pp and you can brunch until your heart's content any time before 5pm on Saturday 9 February. Got to love it. Not feeling the brunch menu? Get 33% off your pizza all day on National Pizza Day. Want to find out how to get your exclusive 30% discount on Saturday 9 February?